Welcome to part 2 of table saw router table. This is where I'll install the router table insert plate and mount the router to it. This is my first experience using a router insert plate. My old table saw router combo just had a hole through the table and the router was attached directly to the table's top. This kind of limited how high I could extend some bits above the table. With the router plate, an extra 3/8" of height is available because the plate is only half as thick as the old table's 3/4" top. This is a much welcome improvement. This is the 3/8” phenolic insert I'm going to use. It comes with four set screws, four magnets, an allen wrench and a starting pin for freehand work. 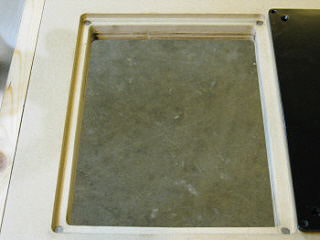 The router table insert plate on the left was purchased from Busy Bee Tools on sale for $21.99. Good price, and it comes with all the hardware shown. This router insert plate has two clip-in inserts that will give me 1 1/4”, 2 5/8”, and 3 7/8” openings. That should cover anything I'll be doing with it. This MLCS router plate kit from amazon looks remarkably similar. It comes with all the same hardware and looks to be about the same size. This MLCS 9334 1/4-Inch Thick Aluminum Router Plate is the type of insert plate I originally wanted to get. It's pre-marked for mounting most popular routers, so it takes a bit of hassle out of mounting the router to the plate. It costs more, but definitely worth it. There's a couple of ways a guy can go about cutting an opening in the router table to fit the router table insert plate. 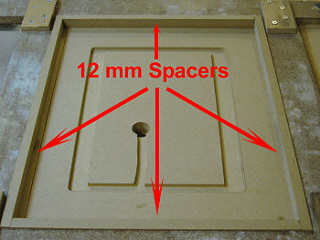 Both of them require the use of a template to guide the router and create the desired size opening. One way to do it would be to use a template guide bushing on the router base with a straight cut bit. The only problem I have with this idea is that of control. The router sits on top of the template and the base is supported on one side only. The method I chose allows the router base to sit flat on the table. This gives me better support, right up till the last cut. It will also give me the depth of cut I need to cut completely through the table top using the router. This measurement will tell me how much to extend the template frame from the router insert plate. In order to find out what size to build the template, I need to know the distance from the 1/2" straight cut router bit to the outside of my router's base. I'm using a 1/2" bit because it matches the radius on the corners of the router plate. I used the step measurement on my digital calipers, measuring from the outside of the router's base to the cutting edge of the router bit. This distance was 2 3/4" give or take a few thou. To make sure the router bit is centered in the base plate, I made four measurements at 90 degree increments around the base. The measurements differed by less than .003", which was good enough for me. If it was more, I would have had to loosen the screws and readjust the base plate. 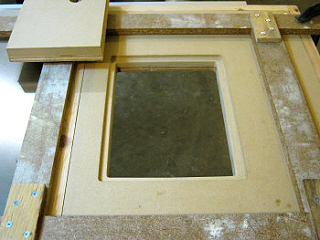 A simple template is all that's needed to cut the opening for the router table plate to sit in. The router table insert plate was centered on the table top 3" from the left side using the table saw's fence to square it and a line was traced around the plate to give me a visual reference to go by. This will leave me enough room on either side of the router to work with larger stock. Making the template itself is pretty straightforward. 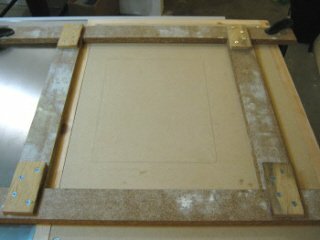 I ripped four pieces of 5/8" mdf 2 1/4" wide off an old cupboard door for the frame and screwed them together with strips of 3/8" plywood. 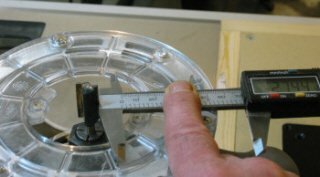 The inside measurement of the template is 2 3/4" wider (the distance from the tip of the bit to the outside of the router's base) all the way around than the router insert plate. Put another way, if you added 2 3/4" to each side of the insert plate, it would fit snuggly inside the template. One last check for square before firing up the router. It's really important to double check your measurements for the template and to make sure it's square. You only get one shot at getting it right, so take your time. It doesn't hurt to make a dry run using the router with the bit hanging just above the table top. It should follow pretty close to the inside of the line that was traced around the router table insert plate earlier. If it doesn't, recheck all the measurements again to find out why. I left the top and bottom pieces of the template long enough so that I could use c-clamps through the cast iron wing on the left side of the router table. The photo on the left shows the finished template clamped down to the table and ready to use. I had to wiggle c-clamps through the slots in the table saw's top to clamp down the left side of the template. It would also be possible to use double sided tape to secure the template, but it's a lot easier to adjust the template using clamps. Although the router table insert plate is close to 3/8" thick (.360"), it has a lip on the outside edge that is only 6mm thick. 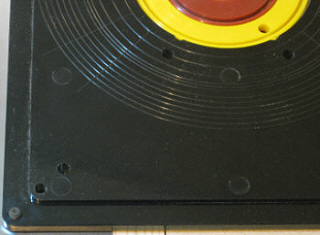 This photo shows the lip on the underside of the insert plate. The lip is 12mm wide by 6mm thick. Since the router table insert plate comes with allen screws for leveling, I can make the first cut 6.5mm deep and not have to worry about getting it exact. Also, the lip on the bottom of the insert plate is just under 1/2" wide, which means my first cut will be wide enough to cover it using a 1/2" bit. I like it when things work out. Before I start cutting with the router, I drilled a 1" starter hole in the waste part of the table with a spade bit. I need the starter hole because I'm using a fixed base router. If you use a plunge router you can probably skip this step. Just set your depth stop at 6.5mm and you're home free. The first pass with the bit set to cut 6.5mm deep. 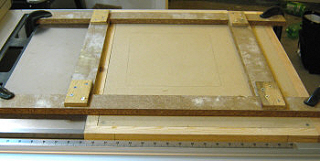 Starting from the hole previously drilled in the table, I made the first pass around the template in a clockwise direction. After this first cut, I measured the depth to make sure it was deep enough. It was right on 6.5mm. I then measured the width and height to make sure the router table inser plate was going to fit. So far, so good. Before I can move on, I need to cut some spacer strips to fit inside the template to allow me to cut out the section of the table where the router plate will sit. I used the same 3/4" mdf that was used for the table top. Spacer strips are added to the inside of the template for the next cut. This photo shows the two sides already cut. I ripped the spacer strips to the same width as the lip on the router insert plate. This will move the router in 12mm on all sides. The spacer strips should have a slight interference fit. This will keep them from moving when running the router around the inside of the template. The longer spacer strips were set in place first, followed by the shorter strips. With the depth of the router bit still set at 6.5mm, I made the second pass around the inside of the template. I used the router to cut completely through the router table. The center waste section is shown in the upper left of this photo. 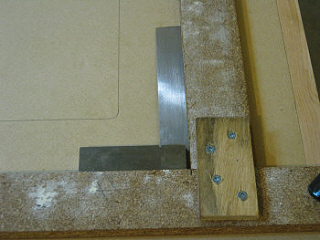 Setting the depth of cut 3/8" deeper after each pass, I kept going until I was completely through the table top. My router's maximum depth of cut was about 1/8" deeper than the thickness of the table, leaving me plenty of room to finish the cut. Mdf cuts pretty easy, but is very dusty... so wear the proper safety equipment. This should include a dust mask and eye protection. A trial fit of the router plate showed that a bit of sanding was required to get it to fit. With the router plate held upside down, I tried it in the recess and it fit nicely. This meant it was the inside edge of the lip that wasn't going into the through hole, so I sanded around the hole in the table until I got a nice fit. 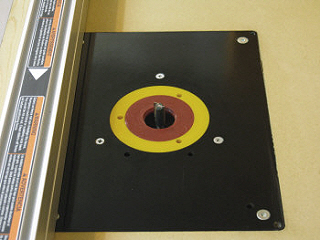 The magnets that came with the router table insert plate are 8mm in diameter and need to be set into the lip on the table top under the set screws that are used to level the router plate. Here I am using a transfer punch to mark the center of the holes where the magnets will go. 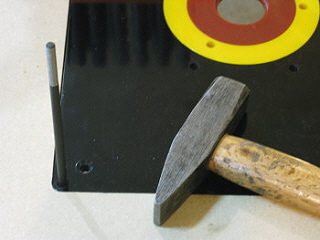 The countersunk hole ahead of the transfer punch is for scewing the router plate in place. The idea is to have the set screws pushing against the magnets instead of digging into the wood. To mark the center of the holes for the magnets, I set the router insert plate in place and used a transfer punch to leave a nice center punch mark to start the drill bit. To drill the holes, I used a regular twist drill that was slightly smaller than the diameter of the magnets. I used masking tape around the drill bit to set the depth of the holes. The finished opening with the magnets installed. The magnets were coated with super glue on the sides and pushed into the holes. The magnets should have a slight interference fit in the holes. These are rare earth neodymium magnets and are very brittle, so don't take a hammer to them unless you use a block of wood between the hammer and magnet. Even then, be careful. What's the best router to use in your router table? The answer to that question depends more or less on what kind of work you're going to be doing with it. If you're only concerned with making a bit of trim or other small jobs, a high horsepower router isn't necessary. On the other hand, raised panel bits can be 3 1/2" in diameter and require lots of horsepower and less rpm. If you're planning on doing this type of work, 2 3/4 hp is probably the minimum you should consider. 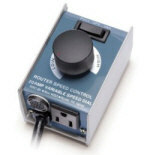 Also, if the router isn't already equipped with a speed switch, a separate router speed control will be needed. A 1/2" collet is mandatory. If you need more information on the different kinds of routers available and what to look for, take a look at Ken's website at www.theroutermaniac.com. He has lots of great articles on routers, tables and general woodworking. Mounting the router to the router table insert plate turned out to be a lot easier than I thought it would be. 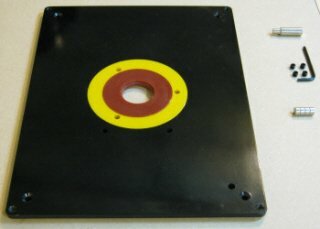 The bottom of the plate has a series of concentric circles that match the base diameter of most routers available today. 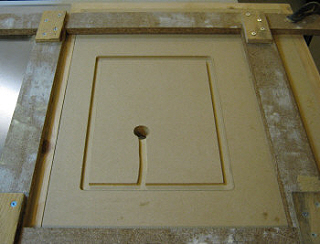 Centering the router's base on the patterns provided on the bottom of the router insert plate. A series of lines emanating from the center, cross the circles, leaving a number of different bolt patterns where they intersect. When I centered the router on the router plate, keeping in mind the direction I wanted the router to face, the screw holes lined up perfectly with the crosshairs left by the lines intersecting the circles. After marking the proper intersects, it was just a matter of centerpunching, drilling and countersinking the mounting holes. 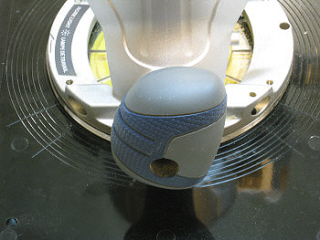 Sharpen the center punch to a fine point and hit lightly or the material will chip. Make sure your drill bit and countersink are sharp. 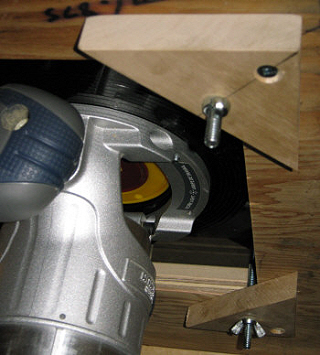 It is best to use a drill press with wood underneath the plate to prevent chip out when the drill bit exits the hole. Use a fairly fast drilling speed. Ease up on the pressure when almost through the hole. For this application, I drilled the holes to 7/32" and then countersunk the holes from the top side of the router table plate. The screws to mount the router to the plate were supplied in the case the router came in. With the router up as far as it will go, I have enough room to change bits from the top of the table. 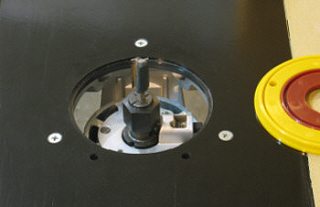 The photo on the right shows the router mounted on the router table insert plate with the router adjusted up as far as it will go. With the center inserts removed, I have enough room to make bit changes from the top of the table. This is a bonus. After I fired up the router, I noticed that the router table insert plate vibrated quite a bit and traced the problem to the loose fit of the allen head set screws used to level the insert plate. A couple of wraps of silicon tape around the threads of the set screws seemed to resolve that dilemma, but it got me thinking about the sturdiness of the whole setup. I wasn't crazy about the idea of only the magnets and weight of the router holding the router table insert down to the table when using large diameter panel raising router bits. I added these birch hold down blocks on the underside of the router table to secure the router insert plate solidly to the router table. Since the router table insert plate already had holes for screwing it to the table, I simply enlarged them to 1/4" and re-countersunk the holes for 3" long taper head machine screws. I fashioned four corner blocks from 3/4" birch and drilled two holes down the center, one for the machine screw and one to screw the block to the bottom of the table. Once I had the router table insert plate leveled with the set screws, I spun wing nuts on the machine screws and carefully tightened them so as not to distort the plate. Now, there's no vibration at all. And the whole thing just feels solid and secure. I won't have any misgivings about spinning those big router bits with this setup. A coat of paste wax finishes off the installation. After I cleaned up my mess, I gave the top a light sanding with fine grit and then waxed it with the same paste wax I use for the saw's table. All that's left to do is build a router table fence. I originally wanted a router fence that would be bolted to the table saw's rip fence, but could also be bolted directly to the router table when I needed the rip fence for another set up. After thinking it over though, I changed my mind and opted for a stand alone router fence. I think it worked out pretty good. Have a look and see what you think. Make a router table for your table saw.